A )Our company has produced a beautiful and unique daisy chain display light, This Linkable display light is of high quality and lightweight, which is an ideal choice for trade exhibition applications.Just install the light on the exhibition board, there will be bright lights on the floor and on the screen below.These lights are made from Daisy chains so that they can be plugged into another socket, which facilitates the management of the power cord. 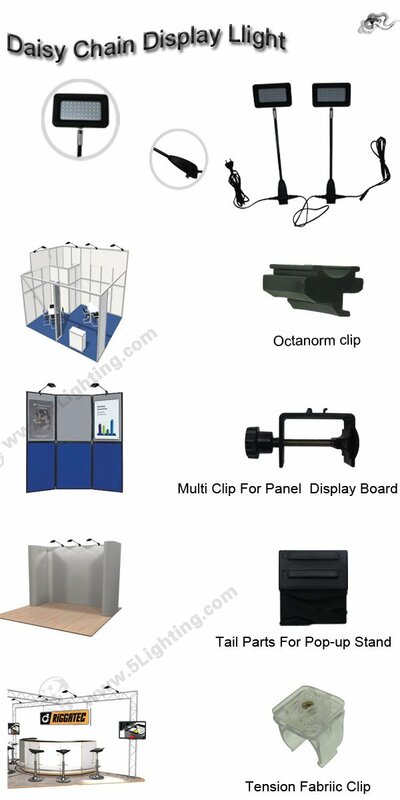 B) Display lights daisy chain for trade show has a variety of tail parts for your choice: Octanorm clip, Multi-clip for panel display board, Tail parts for Pop-up stand, Tension fabric clip etc. No matter what your exhibition board is, this light will be perfect to show you what you want. C) Daisy chain display light using 5050 PCS SMD LED chips as a light source, it only has 10w low heat consumption in a work, does not overheat during long time use, save more energy and cost savings, so as to prolong the service life of it. D) The power of Linkable display lights is about 8 times that of the traditional halogen light, which is longer and more durable in the trade booth.The biggest advantage is that it can reduce a plug so that two or more lights can be lit at the same time. Changing each light in the past requires a plug to reduce the workload. E) Its soft lighting makes the graphics on the display appealing to customers.